There is moss growing in my car. The green, soft, fuzzy kind. It’s in the back window of my car, so as I look back at where I’ve been, I can also see all that I have gathered. I believe in miracles. I believe in the impossible and I am here to demonstrate that a rolling stone like myself can and is gathering moss. In the metaphor a rolling stone gathers no moss, it is suggesting that those who never settle down, who do not put any roots down are unable to allow friendships, relationships or success to stick to them. It is the idea that those who move often, who always travel do not allow anything to attach to them. Thus they are able to live a life of freedom – free of burdens, but also free of some of life’s greatest gifts. I never set out to be a rolling stone, or a gypsy, or a nomad. But I am all of that. And when Spirit told me I would need to go on the road this winter I gave it my best arguments. Winter? Leave Florida? You’ve got to be kidding. Deep inside I am a nester. I long for a home to stay in, for a family to brood over and to throw away the boxes and bags of life on the road. As I resisted the calling my life became painful. I could see that Spirit one way or another always opens my eyes to what is best. So I surrendered to another move. We packed. My daughters and I cleared out of our condo in Orlando, putting everything in storage. It was time for me to go on the road, and it was time to let go of our Florida home. I had been packing and doing my best to remain in faith about not knowing, just trusting everything would fall in place as I go. It was not completely clear where I would be moving to, only that I go. It was not clear how many personal situations would unfold for me and my children, but I was being asked to trust. I showed up in Venice, Florida for my final Florida event in the midst of our packing. A few days later my daughters and I would put the lock on the storage garage and head north. I had left my daughters to continue the packing while I went to teach over the weekend. I was feeling drained physically and emotionally when I showed up at Donna Day’s home in Venice, Florida. But I trusted in Spirit to take care of the teachings that weekend. All that is ever asked of me is that I show up. Spirit takes care of the rest. The group gathered at Donna’s house was tremendously warm and welcoming. I enjoyed our Friday evening and our Saturday together. I was grateful that Spirit blessed me with the right words to say and the energy to say it, for as it always does Spirit came into me and moved through me, giving wisdom and love in an enthusiastic way to those in attendance. However, when the two day event was over, my body dropped like a rag doll’s. I felt more empty than before. After the others had left I sat with Donna and my dear friend and Florida ‘mother,’ Star, on Donna’s patio. The sun was shining on me, but my body was shivering. Donna saw that I was cold, and also sensed that I was drained. She asked what was going on…why I seemed to be on the edge of a great precipice. I shared with Donna and Star that I was being called to move across the country – yet again. I told them that I was tired, and felt uncertain about how things in my personal life were going to turn out. I knew I was being guided to go, but there were so many questions lingering in my mind…and all Spirit would tell me was to trust, to be patient and to go. That was the previous winter. I had traveled all summer, then returned to Florida in the fall, hoping I had done my duty and that now I could have a place to stay. I shared with Donna and Star my pain. I opened up to them and let them see what was inside of me that day. We talked about sisterhood, about how much we need each other. I told them how much I felt called to teach the principles of The Divine Feminine Energies, and one of the most important of these is receptivity. I shared with them all I was learning as these teachings unfolded. I was learning that as women, we tend to give more than we allow ourselves to receive. And it was time to heal that. I was going on the road to connect with other women. I wanted women to learn to lean on each other. I wanted to connect all these beautiful women all over with each other. I wanted to help them to heal, to become their most powerful selves. And I knew that all the women I worked with needed to learn how to receive, how to be receptive, how to be the vessel – the vessel that is overflowing with goodness. Our cups are often drained, because we do not take enough time to let them fill back up. We give and we go and we do. But the energies of the feminine are all about being receptive. About stillness and beauty and grace. It is about receiving graciously. The giving comes from the overflow. And here I was drained. My own cup was empty. I was going on the road to give, and I was beginning with an empty cup. After I finished my whining, Donna went into her bedroom and came out with a beautiful blanket in warm colors. She wrapped the blanket snugly around me, and held me in her arms from behind me. Her words moved me. They touched me deep inside and with the blanket wrapped so tenderly around me I felt a great strength and protection surrounding me. Tears traveled down my cheeks and even as I allowed my emotions to show, my heart felt more full. I looked into Star’s twinkling eyes, as she affirmed all that Donna had said. My shivers disappeared and the warmth of Donna’s words melted into my heart. I sat still and took it all in. I felt the loving, supportive strength of my sisters – of sisters everywhere. And so it was decided that I would share this message as I traveled. I would wrap all my relations in the loving warmth of the blanket. And I would connect everyone somehow, through this message. We are one and we are all connected. And we must all learn how to receive love and support from each other. I went to Venice to give. I went to teach and to help others. I left with so much more. Later I looked at the beautiful blanket. It is a beautifully embroidered blanket with colorful renditions of women of every race and nationality upon it. 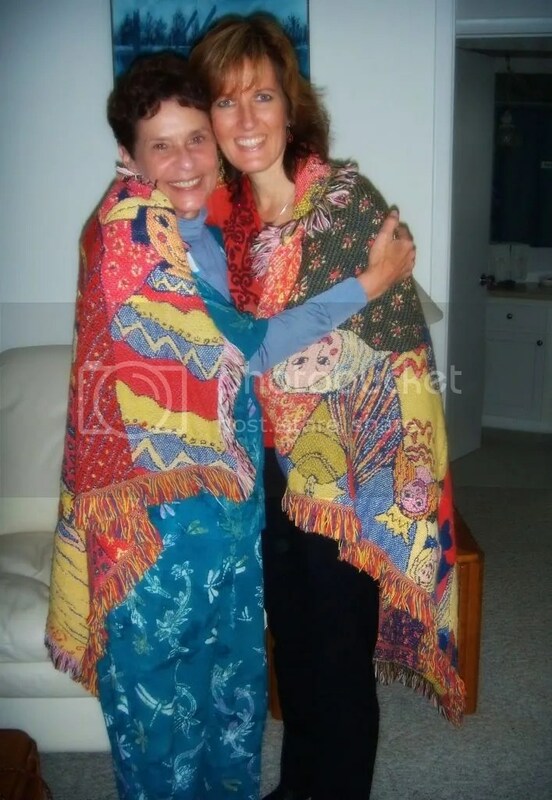 It is called, “Strong and Beautiful Women.” But we renamed it the “Strong and Beautiful Sisters” blanket that day. So this was the first thing that I gathered as I left the sunshine state. I gathered the love of the dear women of Venice. I received their love and their blessings. I received a blanket to keep me warm. I received a blessing of love and protection. On my way back to Orlando, to pack up the last of my things, I considered all that Donna and Star had given me that weekend. And I realized how much I had grown because I allowed myself to receive. Donna had created a gathering for me to teach. Donna fed me and took care of giving me privacy to meditate and prepare before each class. Star had taken me home to her house where she had lovingly prepared her guest bedroom for me. She had a hot breakfast waiting for me on the table in the morning. She even made sure I had all I needed before she said, ‘good night.’ I had been nurtured. I had been fed and kept warm. And I had to let myself receive these blessings. This time I did not hide behind hotel room walls, I enjoyed the intimacy of friend’s homes. I allowed myself to be at home with them, and to receive their love. And as I prepared for the next few weeks of travel, I promised myself I would learn to say yes more often, to the offerings of friends. I would allow myself to receive. 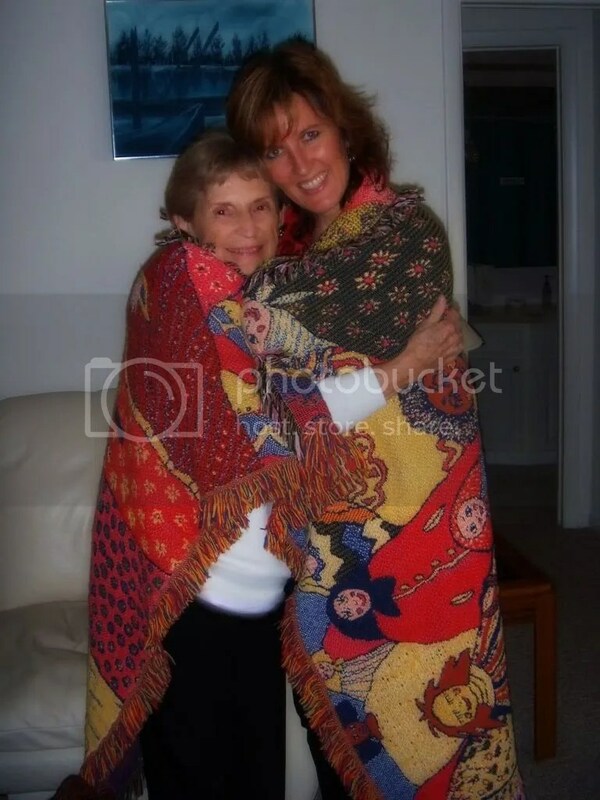 My Dear Sister, Donna Day and I wrapped in the sisters blanket. My Florida mother, Starling ‘Star’ Miller and I. Thank you are your honesty and openness. You are an inspiration to all of us who think we have to always be ‘strong’ and ‘together’ to serve, when in fact our tenderness and vulnerability creates a powerful bond with others.